Want to sell your insurance services online? 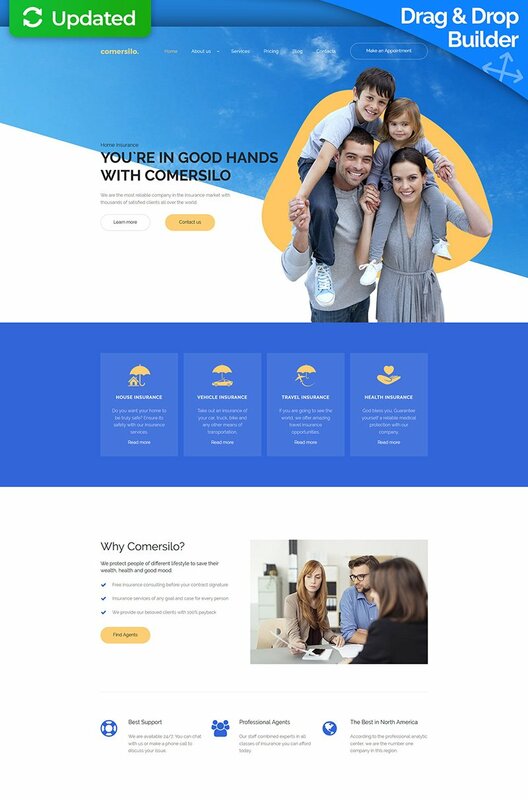 Launching a website that will look credible for the users will be a piece of cake with this Insurance Moto CMS 3 Template. Full-screen photo of the happy family creates a positive atmosphere on site. There is a big, noticeable 'Make an Appointment' button designed as a 'ghost element' at the right top corner of the page. It seamlessly blends with the general design concept. Static layout of the template is revived by HTML plus JS animation. Lazy load effect won't make your customers wait until your content is being loaded, which makes sense today as site loading speed matters. You can integrate videos into your web page, which will make it much more engaging. The theme lets you choose between Carousel, Slider, and Grid gallery scripts as well. As you see, this template provides all necessary features to make your website competitive.